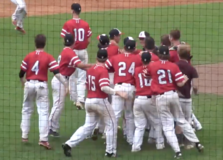 The Ponies baseball team will face Minnetonka for the state title! The 4A championship game takes place Monday at 1 p.m. at Target Field. The Ponies came back in the semifinal game to defeat Blaine 4-3. Watch the highlights. Stillwater Area High School junior Ben Valerius was named a finalist for the Triple Threat Award and Jimmy’s Award by the Hennepin Theatre Trust. Valerius was recognized by the Trust’s Spotlight Education program for his singing, acting and dancing as well as community leadership. 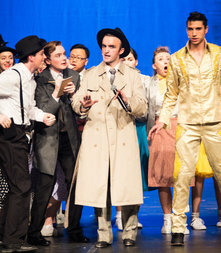 In addition, he won Outstanding Performance in a Leading Role for his portrayal of Albert Peterson in Bye Bye Birdie. Freshman Olivia Bystrom won Outstanding Performance in a Supporting Role for her portrayal of Jan in Grease. Stillwater also received two Outstanding Technical Leadership awards: Lee Menzel as Deck Captain in Bye Bye Birdie and Anne Sullivan as Stage Manager for Grease. In addition, Stillwater Theatre received a Community Engagement award. Read more on our website. Students at Lily Lake Elementary and sixth graders at both middle schools were among the first in the country to try out Google’s Augmented Reality (AR) app. With Expeditions AR, teachers can bring virtual 3D objects into the classroom. (Think Pokemon Go meets education.) Expedition AR helps teachers bring abstract concepts to life, giving students a deeper understanding of the world beyond the classroom. Not to mention it’s a whole lot of fun! Watch the video. The Class of 2024 recently completed a community project for their classmates at Stillwater Middle School. 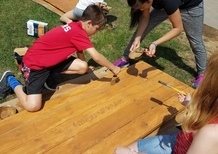 The sixth graders built five new picnic tables for the school. Teachers Andrew Jurek and Nick Ardito supervised the construction project which was made possible by family donations of wood, hardware and tools. They are calling it a legacy project and plan to continue to add to it each year with related projects. Photos on Facebook. Students who attended our Youth and Community Accountability and Prevention Program (YCAPP) took part in a community outreach project making mats for the homeless out of plastic bags. Paraprofessional Priscilla Smith spearheaded the project which not only taught students about the struggles of homelessness, but also about pollution and recycling. 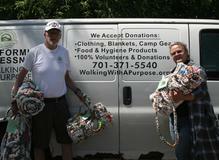 The mats were donated to Walking With a Purpose which will distribute them to people living in homeless camps in the metro area. 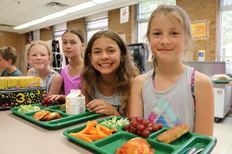 Stillwater Area Public Schools is offering free breakfast and lunch to area children (2 to 18 years old) this summer at Andersen and Lily Lake elementary schools, thanks to special federal funding. The goal of this program is to make sure all youth in our community have access to nutritious meals while school is out for the summer. Families will not be asked to fill out any paperwork and no names will be taken – kids just need to show up to eat! See menus, date and times online. Tickets on sale for Mulan Jr. It is up to the misfit Mulan and her mischievous dragon, Mushu, to save the Emperor! As the great battle with the Huns approaches, Mulan must choose between revealing her true identity or saving all of China with her clever plan. Wednesday, June 27th at 7 p.m.
Thursday, June 28th at 7 p.m.
Friday June 29th at 7 p.m.
Tickets: $10/adults, $7/students and seniors, $5/children 5 and under. Purchase online. At a recent school board work session, board members dug into a detailed 75-page demographic report to help with long-term facilities and program planning. 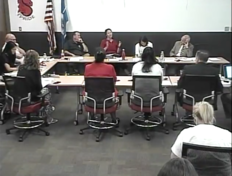 Originally presented to the board in April, this session allowed members to go deeper in their understanding of how the comprehensive report - which covers past and projected demographics, housing and enrollment data - can help them be proactive in aligning program needs with facilities and space issues. The information presented by TeamWorks International is designed to help provide “enrollment intelligence”, so the board and administration can think and plan 3-4 years ahead as they monitor trends and changes across the district. Watch the work session. Stabilized the employee pension fund, which is good news for current and future retirees as well as for school districts. Created $25 million in school safety grants that may be used to design, construct, furnish and equip school facilities, and includes renovating and expanding existing buildings and facilities. Because our school district has been working with Washington County on reviewing our buildings for safety and security issues, we are in a good position to submit a proposal to the state for one of these grants. The safety grants will be awarded on a first-come, first-served basis across the state of up to $500,000 for each qualifying school building. While this may seem like a lot of money, if every grant awarded receives the maximum amount, it will only cover 50 school buildings across the state. The school board will hold a closed session to discuss property identified as Marine Elementary School. The closed session will begin at the end of the regular business meeting Thursday, June 21, 2018 at Stillwater City Hall. Pursuant to Minnesota Statute §13D.05 Subd. (3) to develop or consider offers or counteroffers for the purchase or sale of real or personal property. Notice is hereby given that the school board will hold a special meeting to declare a vacancy on the School Board. The special meeting will begin at 8 a.m. on Friday, June 22, 2018 at Central Services.